Christmas is a time for family holiday traditions. Our family’s holiday traditions include building a fire in the fireplace, roasting marshmallows for s’mores, decorating the house, trimming the tree, and visiting Atlanta to celebrate the season at some spectacular holiday events. I hope these 12 holiday season festivities in and around Atlanta bring your family as much joy as they have brought my family over the years. 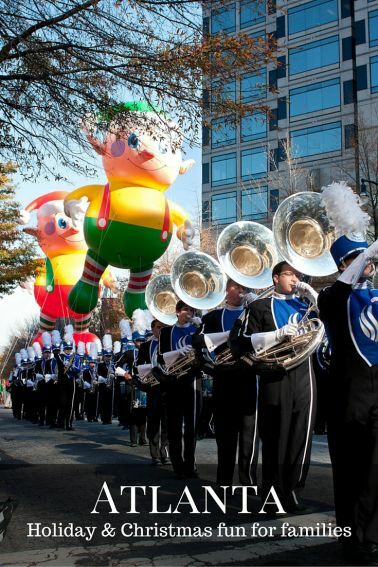 Throw on a scarf and bundle up your kiddos, it’s time for an adventure as we celebrate 12 days of Christmas events in Atlanta! Updated for the 2018 holiday season. Ninety minutes north of Atlanta in the Blue Ridge Mountains, Santa takes a break from his holiday duties to spend a little time with the kids on the Blue Ridge Scenic Railway. Santa Express rides are only one hour and ideal for younger kids. Listen to a Christmas story, sing carols, and visit with Santa himself. Each child receives a special gift. Book tickets early because this is a sell-out event! The Georgia Aquarium offers a number of holiday entertainment options for families. 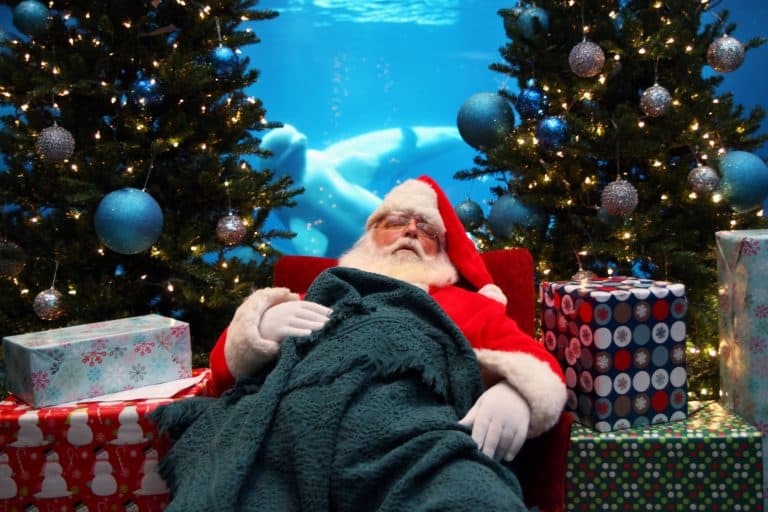 Begin with the Wake Up Santa event, where you can help wake him from a summer slumber to kick-start Christmas at the Aquarium. Enjoy the dancing light show every hour in the atrium. Also in the atrium, Santa is available during weekends to hear your little one’s wish list and snap a photo. Finally, don’t miss interacting with SCUBA Claus who dives in at Ocean Voyager to answer questions about the animals in this habitat. 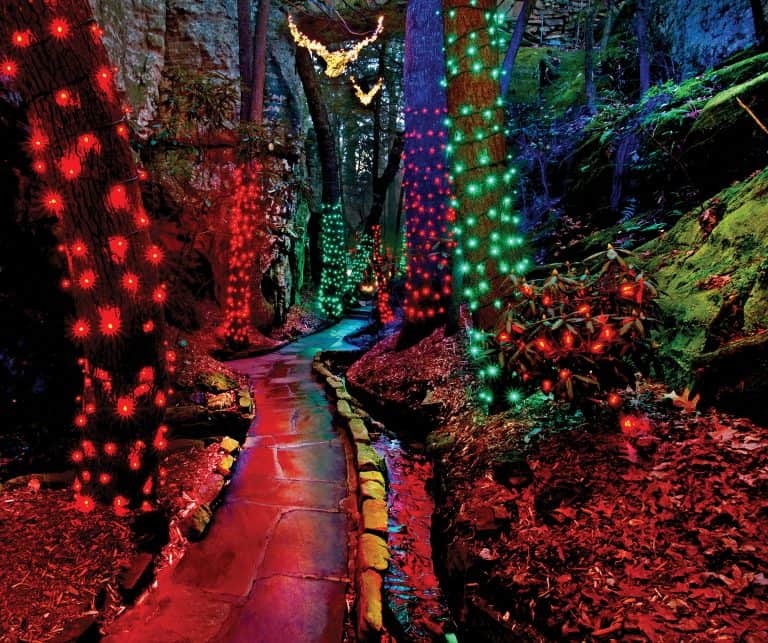 Imagine Rock City’s gorgeous gardens and 200 million year old rock formations lit with hundreds of thousands of lights. Walk through at 43-foot tree of light into glittering holiday scenes. Live entertainment and Santa visits are available nightly. Also at Enchanted Garden of Lights, families can decorate cookies and listen to stories with Mrs. Claus. As a special treat, your family can dine with Santa for dinner and enter the garden VIP style. 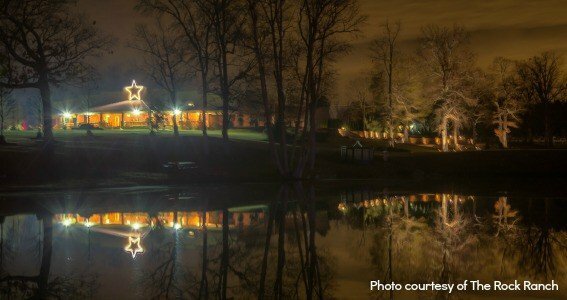 Truett Cathy launched the Christmas program at The Rock Ranch when he purchased leftover lights from local home improvement stores and decorated the grounds with the help of numerous volunteers. It was his vision to bring an affordable light show to families across Georgia. Now the ranch is lit for over a mile, and families can drive through this spectacle for free, although donations are gratefully accepted. For a fee, families can participate in Country Christmas Nights. Take a tractor ride through the lights and visit with Santa. 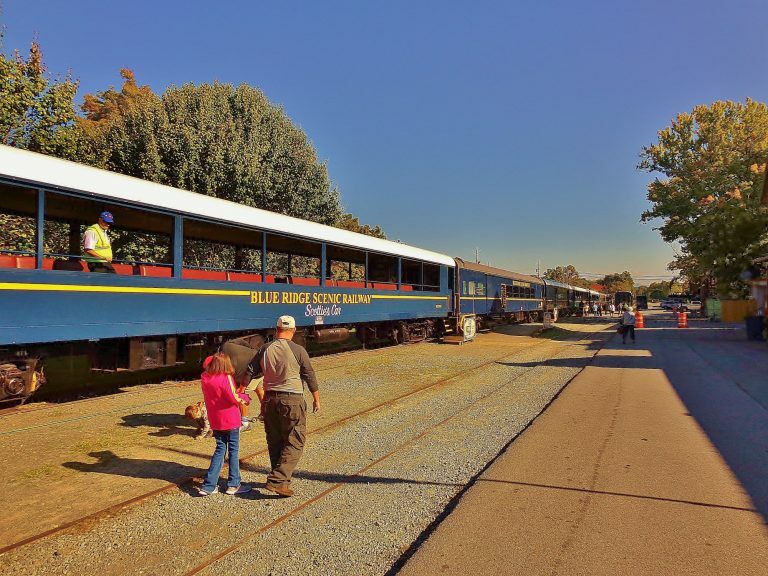 Additional activities include the Christmas Express Train and Santa’s Workshop with cookie decorating, story time, face painting, and more. The Magical Night of Lights trail leads you through hundreds of light displays along a 7-mile meandering drive. Included in the fun are carnival rides, visit with Santa and large bonfires for roasting marshmallows. And you won’t want to miss License to Chill Snow Island! This snow play area features super-fast snow slides, ice skating, and more. 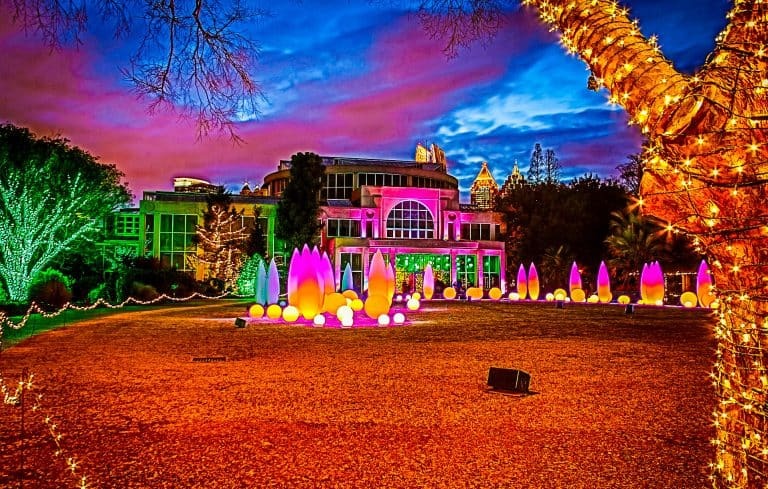 During the day families can ride the Botanical Express holiday train around the Atlanta Botanical Garden grounds or watch the Reindog Parade. Kids will especially love the outdoor holiday model train, a magical display with seven tracks and a mountainside landscape. Saint Nick stands in the garden with a green velvet robe and a botanical head wreath. His nature-inspired dress combined with the garden backdrop makes a magnificent family photo, so be sure to bring your camera. 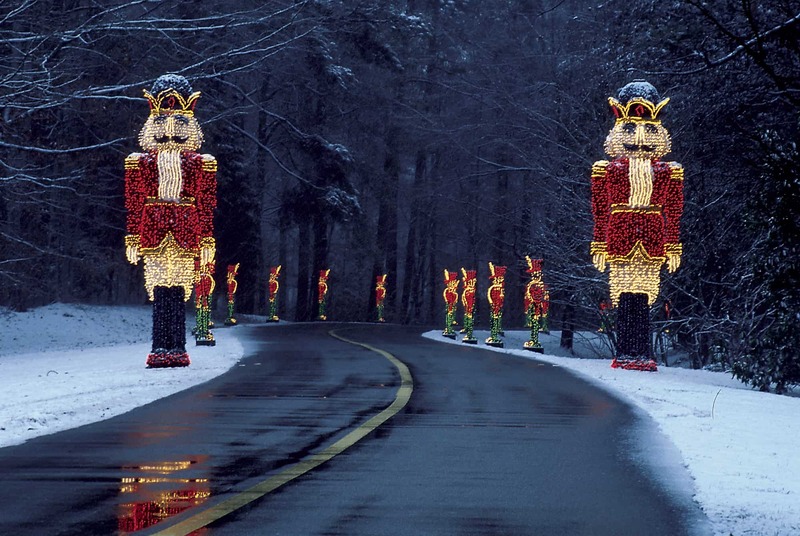 The highlight of the holiday festivities is Garden Lights Holiday Nights, a spectacular nighttime light show. Millions of lights outline the trees, shrubs, and decor, turning the garden into a winter wonderland. Grab a s’more kit for the kids and a holiday cocktail for yourself and don’t miss this stunning show. Visiting Stone Mountain Christmas, with its millions of twinkling lights, is a wonderful family holiday tradition. This is the perfect backdrop for a night of exciting events including live holiday performances, stories from Mrs. Claus, and greetings from Rudolph, Bumble, and the dazzling Snow Angel. 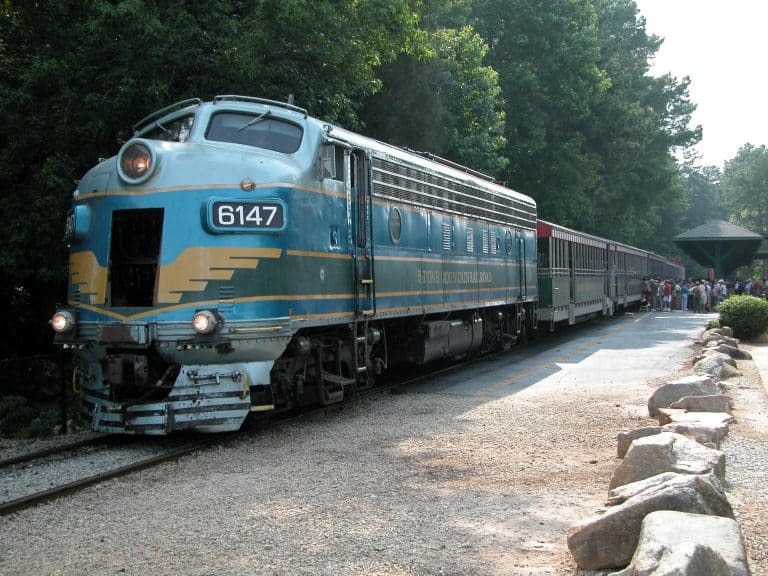 Be sure to make time for the Singalong Train, which circles the base of Stone Mountain. There are plenty of shopping opportunities and fun places to eat. At evening’s end, grab a seat for the nightly Christmas Parade with festive floats, and Santa and Mrs. Claus. For the grand finale, see the Snow Angel fly up to create a magical snowfall complete with a fireworks finish. Head to Atlantic Station to kick off the season at the Light the Station. For one night only, enjoy kid’s activities, visits with Santa’s Reindeer, a parade, and more. All season long families can skate at Atlantic Station’s ice skating rink and visit St. Nick at Santa’s Cottage. Make it a festive family time with events like College Nights and Throwback Thursdays. There are plenty of places here to grab a hot cocoa with dinner or work on your holiday shopping. 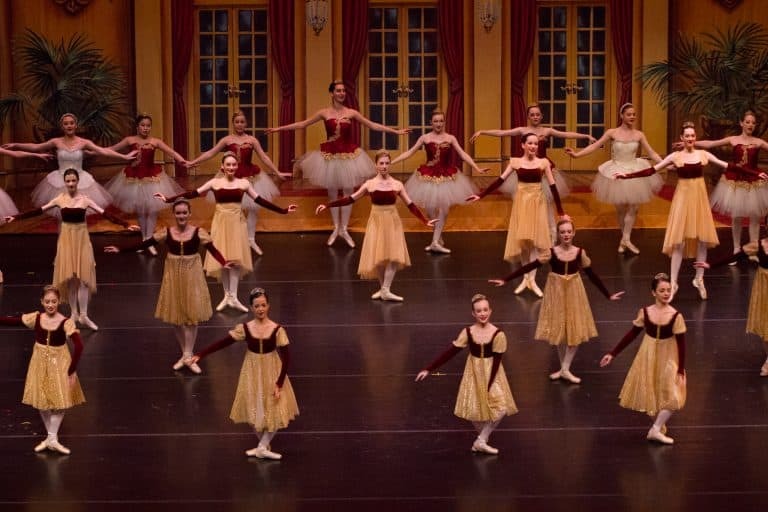 Older children will treasure a visit to the Fabulous Fox Theater for a memorable live performance of Nutcracker from Atlanta Ballet, a tradition that has been in Atlanta for over 55 years. The Atlanta Ballet’s rendition of The Nutcracker is the only performance in the metro area with a live orchestra and choir. The Macy’s Pink Pig ride has been a tradition in Atlanta for over 50 years. With a portion of the proceeds from each ride benefiting Children’s Healthcare of Atlanta, it is a must for every Atlanta family. 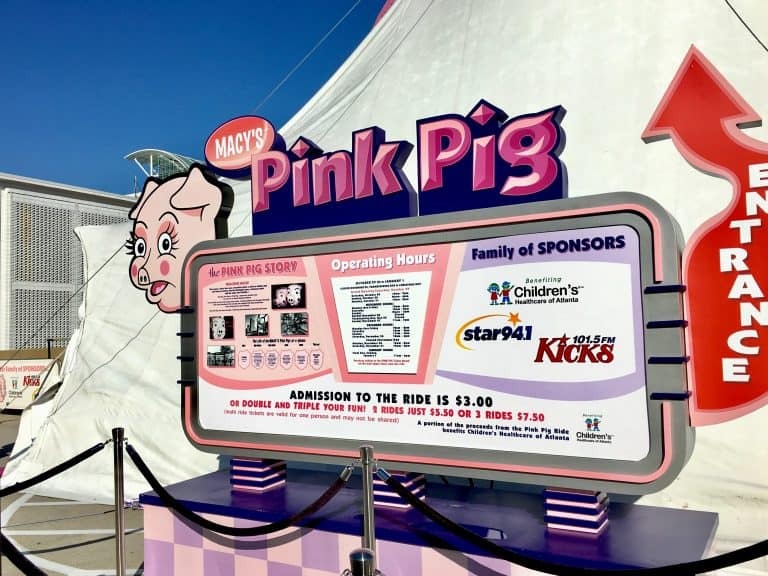 You can find Priscilla the Pink Pig under a large tent on the upper-level parking deck of Lenox Square Mall, near Macy’s. Purchase tickets for two rides and you don’t have to exit the train to get in line again, simply keep your seat and ride a second time. 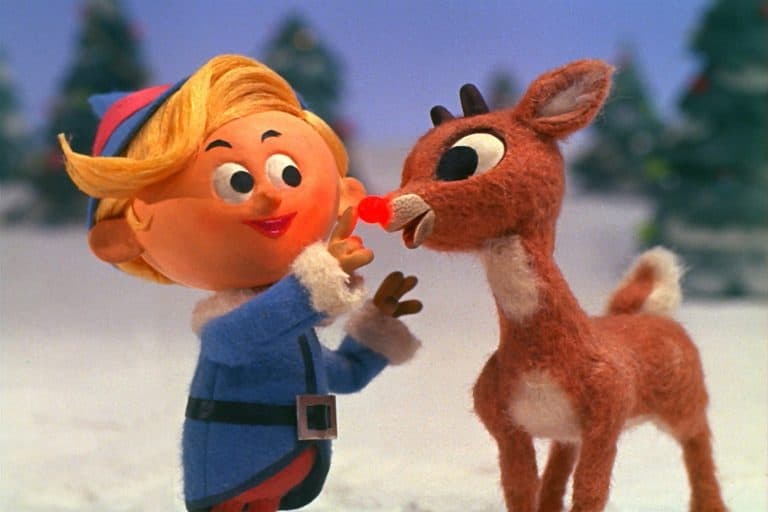 You’ve seen the TV classic, Rudolph the Red-Nosed Reindeer; now you can watch it come to life. This puppet show adaptation mirrors the 1964 television classic. It is a special time to spend with your kids enjoying a beloved holiday tradition. The Center for Puppetry Art’s theater is cozy and intimate and allows you to get lost in the story. After the show, head upstairs to make a Bumble Snow Monster hand puppet to take home. Whether by car or Jolly Trolley, this spectacular light show is nothing short of amazing. 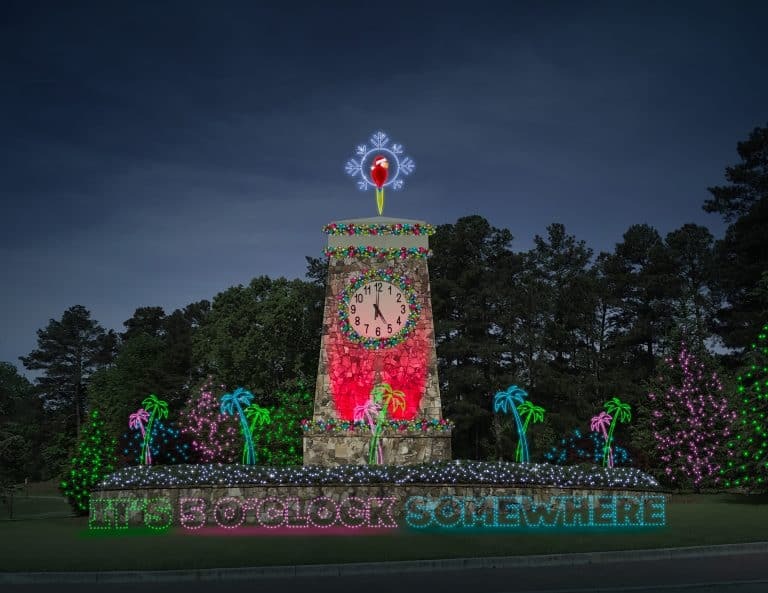 Ride through Callaway Gardens to take in over eight million lights that National Geographic Traveler has called one of the top 10 light shows in the world. Snowflake Valley is our family’s favorite display, with its twinkling lights raining down, offering a “White Christmas” rarely seen in Georgia. 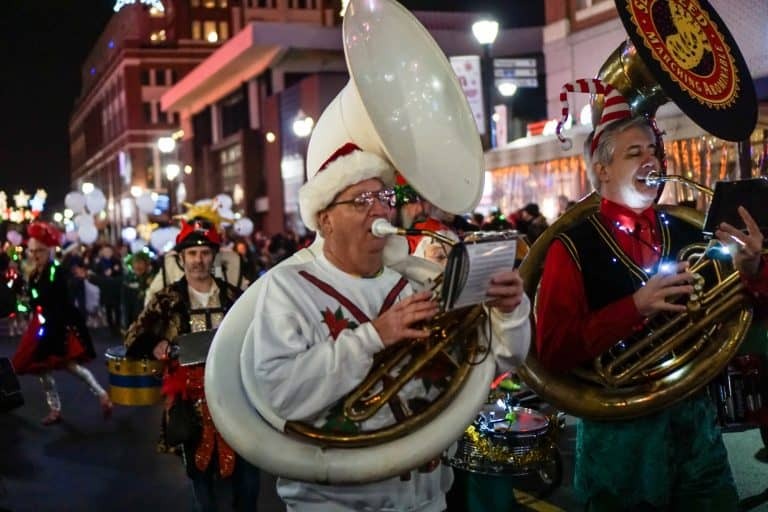 There are new specialty nights offered this year including bike, motorcycle, and golf cart rides through the lights, and the March of Dimes Nightwalk, benefiting the March of Dimes. The Christmas Village offers shopping and snacking options including Christmas spirits for adults. Bed and Breakfast packages are available, which include admission to Fantasy in Lights as well as the Garden. Special thanks to Tiffany Vaughn for updating this post with information for 2018. For even more holiday fun in Atlanta, check out 25 sparkling Christmas light displays near Atlanta.